A lavish meal sometimes leaves a small prickling pain inside me thinking if you need that entire extravaganza just for a meal? I make lavish meals only on special occasions or parties. My normal cooking plan includes a meat, veggies and grains. That is the reason why I use to get panic attacks when unexpected visitors show up during lunch time...LOL. But blogging had made me tackle this situation to a great extent. The short cut methods of preparing food in a jiffy are my resorts for these situations. Keeping a batch of freshly ground ginger garlic paste and caramelized onion paste in the freezer gives me the ease to make curries in jiffy. It’s almost a routine for me to make a small batch of these pastes every month. Before winter starts I have to make a bigger batch of caramelized onion paste to save some time in the kitchen. I like to plan the weekday dinner on the weekends, so that I can prepare either the base or get the ingredients ready to cook on the weekday. I do this preparation for kids’ lunch box too, which makes my life easier every morning when everyone is busy. 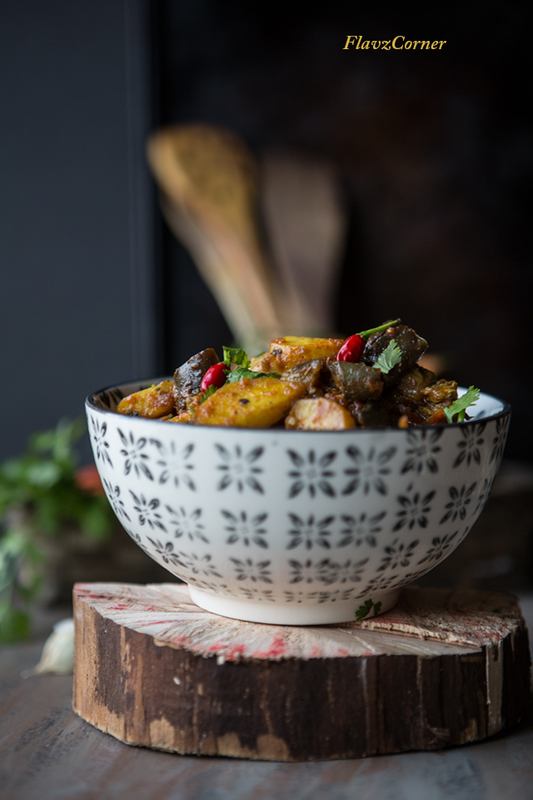 Here is a simple recipe for Spicy Roasted Potatoes with Eggplant/ Aloo Bhangain Masala that I make to serve with Rotis/Chapathi. 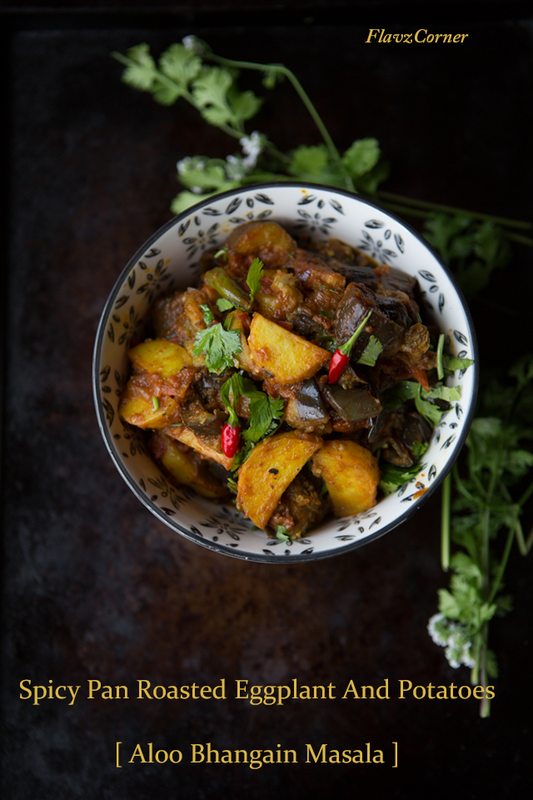 The spices used in this dish enhance the plain bland taste of eggplant and they can be served well with steamed Basmathi rice too. I like the dry version of this curry rather than the gravy version. In fact this dish is not very dry. It has a very thick paste like gravy that will keep the dish moist. I usually use the long Asian egg plant for this dish because they cook faster and absorb the spices fast. Hope you will try this recipe and let me know how it turns out for you. Peel the potatoes and cut into cubes. Keep them in a bowl of water to prevent oxidation. Wash and pat dry the eggplants. Cut them into 1 inch thick pieces and cut into half. Each piece should look like semi circle. Heat 2 tbsp of oil in a wide mouth non stick pan. Once the oil is hot add the eggplant pieces and 1/4 tsp of turmeric powder. Sprinkle some salt to taste and cook on medium heat till the egg plant is cooked and becomes soft. Stir in between and cover with a lid to help even cooking. Don't over cook them, they will lose their shape. Transfer to a bowl lined with paper towel. Now add 1 tbsp of oil to the same pan and add the potatoes. The oil should have enough turmeric in it. If not add 1/8 th tsp of turmeric powder. Adjust the salt and cook the potatoes on medium heat with the pan covered with a lid. Flip the piece in between to help even cooking. Once the potatoes are cooked well and lightly browned, transfer them to a bowl. Lower the flame and add 2 tbsp of oil. Splutter cumin/jeera and fennel seeds (if using) in the hot oil. Add ginger garlic paste, chopped onions/ caramelized onions, green chili, salt and turmeric powder and cook on medium heat by mixing well. Close the lid and cook for 5 minutes. Now add the coriander powder, chili powder, garam masala and cook them till the raw smell is gone. Add the chopped tomatoes. Close the lid and let it cook on low heat for 10 minutes or till tomatoes get mushy and the masala becomes a thick paste. Add the roasted eggplant and potatoes to the masala. Mix the vegetables, so that the masala/thick gravy gets on all the pieces. Close the lid and cook for 5 minutes. Rub the dry fenugreek leaves/Methi leaves between your palms and add along with chopped Cilantro to the dish. Cook for another minute and turn off the flame. Transfer to a serving bowl and enjoy it with some freshly made Roti/Chapathi/Indian flat bread. 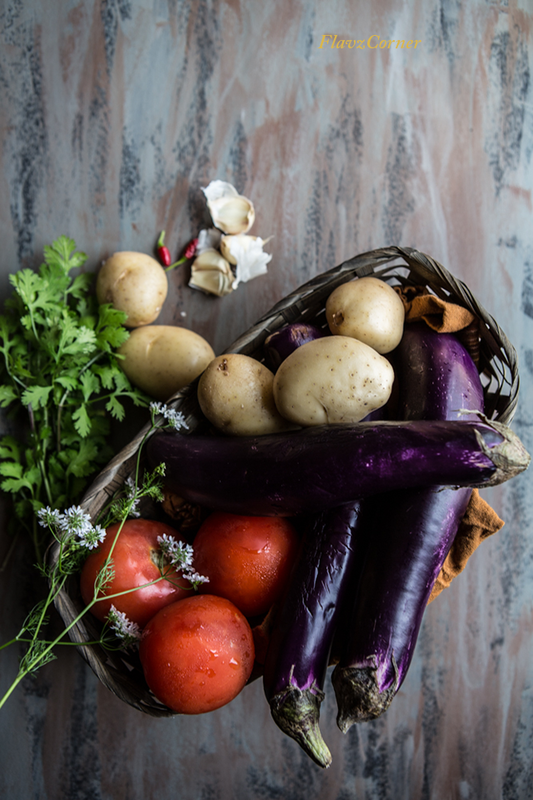 I am getting warmed up to the notion of using eggplants after seeing your pics. Looks perfect for chappathis. Hope you will try it Indu!! What a nice visual treat dear..lovely recipe and awesome click. What an idea of storing caramelized onion in the fridge...I should try it.. Thanks Anupa for the comment! It goes well with Chapathi. Hope you will try it. Caramelized onions saves a lot of cooking time in my kitchen. This is such a comfy and cozy dish. All I need some hot rice or paratha to accompany this beauty. YUMMY! Yes Anu, a bowl of steaming hot rice or freshly made parathas is the right combo for this dish. A really comforting and delicious dish. Lovely shots, Shibi. Thanks Angie for the support!! You are one reliable visitor. Thanks Remya!! Hope you will make this dish some day and let me know. I love dishes like this with my Rotis. Simple and easy recipes always wins my heart. Thanks Sandhya!! Yeah, I like to make this dish with the long baingains rather than the regular eggplant which makes a difference in the taste I believe.